California is changing and the education system needs to change with it. In some ways it already has. Gov. Jerry Brown’s state budget predicted that the California Latin@ population would surpass whites in 2014. This year also marked the first time ever the University of California admitted more Latin@ students than white students. Of the 130,211 California resident frosh who enrolled from 2009-13, students who identified as Latin@/Chican@ accounted for 36.7 percent of enrollment — 47,917 students — more than four times the amount who enrolled 20 years before. Dramatic shifts in state demographics mean higher education institutions must respond to ensure that retention and graduation rates increase with the population trends. “Hispanic Serving Institutions” across the country are attempting to address those issues that come with the increasing Latin@ population. UC Santa Cruz is in the process of joining that list. 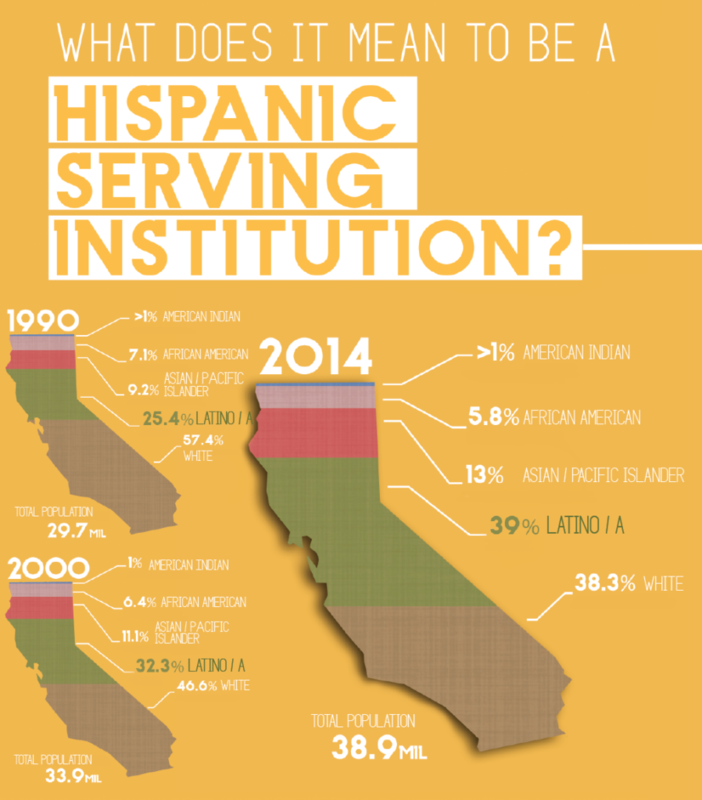 The number of schools designated as “Hispanic Serving Institutions” has grown alongside the national Latin@ population. In 2012, there were 370 HSIs in the nation, nearly double the 189 HSIs in 1991, according to Diverse Education magazine. In 2012-13, there were 277 emerging HSIs, or schools with 15-24 percent undergraduate full-time Hispanic enrollment. One way the federal government is addressing the shifts in education is a federal grant program amended to the Higher Education Act of 1965. The U.S. Department of Education awards grants to universities that meet guidelines, including an enrollment of at least 25 percent Latin@ undergraduate students at the end of the award year, as well as having at least 50 percent of those students come from low-income backgrounds. The application process for the grant programs requires schools be “eligible” first (which also requires an application). If the school meets the criteria, a school is designated as “HSI-eligible” and it can apply for the competitive grants. In 2012, a committee of faculty, staff and students was formed by UCSC administration to pursue the designation. Students and campus adminstrators similarly define what it means to be a “Hispanic Serving Institution” — not just enroll Latin@ students but ensure they graduate. Bandera was an original member of the HSI committee and her main project was to collect data for a report with findings that the committee would present to top university administrators. The data being collected by the committee includes interviews with student focus groups and analysis of the UC Undergraduate Experience Survey, a systemwide but campus-specific survey available to all students, and courses with high-failure rates. The HSI committee identified four main areas of improvement regarding student success: advising, writing, STEM (science, technology, engineering and mathematics) and climate and community. Bandera said UCSC’s designation as an HSI would have a limited impact if there wasn’t a communitywide effort to clearly define what it means to support Latin@ students. The committee is conducting more in-depth research on what prevents students from graduating to later identify what funding sources or grants are available to address those needs. The option receiving the most focus is Title V Part A of the Higher Education Act of 1965. For the second year, UCSC is HSI-eligible. Of the UCs, only UC Riverside and UC Merced are also eligible for the Title III and Title V federal grant programs. Currently, there is no UC campus on the list of over 240 colleges and universities across the country awarded the Title V Part A grant, or Developing Hispanic Serving Institutions Program. Only UC Riverside has been awarded a Title III grant for the Hispanic Serving Institutions STEM and Articulation Program. Other ineligible institutions may apply for a cooperative grant, which requires only one HSI-eligible institution in cooperation with one or more institutions. UCSC doesn’t have plans to apply for the Title V grant for fiscal year 2014, Reguerin said, and UCSC won’t until the committee feels it has completed the research thoroughly. Although the grant award is primarily to increase opportunities for the Latin@ student population, Reguerin said the campus’s goal includes successfully educating and supporting both Latin@ and non-Latin@ students, in several different areas and across disciplines. Recently, the HSI committee was awarded a student position by the Chancellor’s Graduate Internship Program, which sponsors graduate student research focused on improvements of campus environment, diversity, community or student success. Arnold Sanchez, an education graduate student, will help move the analyses along. Sanchez said there is minimal research and discussion in the academic realm about HSIs and the success of their projects. Considering race as only one variable of many and focusing on how race interacts with institutional variables is critical, Sanchez said. Although some people are “scared to talk about race,” he said the intent behind programs like the HSI program is not meant to devalue other groups, but to promote educational equity. The committee has identified four main areas of improvement. It is conducting further research into these four areas prior to applying to grants. Below is an exploration of what some that research and what people in the community think. 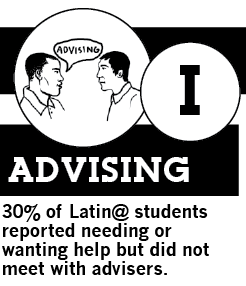 Latin@ students are more likely than other students to see at least one adviser for help on deciding a major, said Dr. Anna Sher, UCSC’s Assistant Director for Institutional Research, Assessment and Policy Studies. Dr. Sher led the analysis of the 2012 results from the UC Undergraduate Experience Survey, which included questions about advising specifically requested by the HSI committee. Of the Latin@ respondents, 60 percent were first-generation, compared to 22 percent for non-Hispanic white students and 44 percent for Asian American, said Stacey Sketo Rosener, Academic Advising Coordinator for Undergraduate Education. Even though Latin@ students are more likely than other students to visit advisers for deciding majors, there are some discrepancies about when exactly Latin@ students are asking for help. Thirty percent of students reported needing or wanting help but did not meet with advisers to get information, according to the survey results. Lupe Allen has been an academic adviser at UCSC for 13 years, currently serves as the Porter College Academic Preceptor and was on the HSI committee for a period of time when it started in 2012. Allen said Latin@ students, like many other students, face a transition after high school that is more difficult for first-generation students. Executive Director for Retention Services and Educational Opportunity Programs Pablo Reguerin said students who are experiencing difficulty at the university are “incredibly talented, bright and hardworking” but may not be prepared enough if they come from low-income schools. “It’s not because they don’t have the ability or the talent, but they just haven’t connected in the right way and sometimes the students who are the most successful just had more help along the way,” Reguerin said. There are distinct challenges some students face that come with attending a high school that doesn’t adequately prepare students, including difficulty writing at the university level. “We’re starting to see the impacts of a ‘testing, testing, testing’ culture that doesn’t allow students the time they need to develop their critical thinking skills prior to arriving at college,” said Writing Program Chair Heather Shearer. Not only are students expected to think and write critically in college, they also have to adapt to academic language they may not be accustomed to. Robin King has taught the core course at Oakes College — the college with the highest percentage of Latin@ students, with almost 46 percent, as of fall 2013 — for 20 years. She said some students may fall within what she called “Generation 1.5” — Latin@ students who might be second-generation but linguistically function as first-generation, since they spoke Spanish until they went to elementary school and then started learning English. At UCSC, the percentage of incoming students who satisfy the UC-wide Entry Level Writing Requirement has decreased from 66 percent in 2008 to 58 percent in 2012. The decrease is reflective of systemwide trends, said Mark Baker, who teaches in the Writing Program and Oakes College and is on the HSI committee. He said there can’t be assumptions made that all Latin@ students need additional help with their writing, but the best way to know is to directly ask students. The Writing Program will conduct interviews for the HSI committee with second to fourth-year Latin@ students about their previous writing class experiences and writing history. “One of the responsibilities at the department and university level is to continually be checking in — how and in what ways might there be a disproportionate number of students coming in with lower test scores or coming in requiring more writing instruction and to not ignore that,” Baker said. Baker said he hopes the campus as a whole will continue considering who UCSC’s students are and where they come from. Latin@ students, and underrepresented groups in general, are not graduating at the same rates as other students. Part of the concern is how safe or comfortable students of color feel on campus and how that affects their academics. Nallely Ramirez, former Co-chair of Movimiento Estudiantil Chicano de Aztlán (MEChA) said many members in MEChA, including herself, feel “comfortable” in the Latin American and Latino Studies department. But that might not be the case for students in other majors. 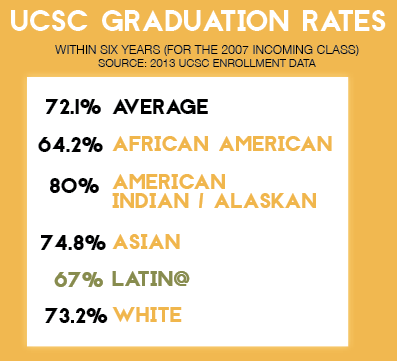 In 2013, UCSC faculty was 61 percent white and 6 percent Latin@. “It’s crucial that if this university is going to be a Hispanic Serving Institution, [it must] have and hire professors who look like us and who understand where we came from,” Ramirez said. Students of color on campus can at times struggle with adjusting to the “language, behavior and culture” of academia, said Latin America and Latino studies professor Hector Perla. On top of passing classes, some students face racist incidents, feelings of loneliness, unstable family situations and financial troubles. Some find support in student organizations. Ramirez first joined MEChA because she was looking for an experience that she wasn’t getting just by attending classes, and as a student of color, she needed a place to relate to other people. The increase in Latin@ students though has put a strain on campus resources, said Chicana/o Latina/o resource center director Dr. Judith Estrada, who was recently added to the HSI committee. Estrada said she has worked with the same budget as previous directors, even as more Latin@ students enroll. Carolynn Jimenez, a computer science and linguistics major and former President of the Society of Hispanic Professional Engineers, said retention within STEM fields is a concern, since she has seen two chairpersons of the club leave the university. She hopes any HSI grant will be used to address disparities in retention. While Jimenez said many UCSC computer science professors have been encouraging of her and her background, the mainstream portrayal of STEM fields and companies like Google — which released demographics showing a predominantly white and male workforce — make it feel like she can’t be a part of the industry. A sense of belonging can be an issue for students of color, she said, since being “one of the few” in her courses at times has been hard. Tracy Larrabee, a computer engineering professor and the Associate Dean for Undergraduate Studies, said one of the obstacles her department tries to help students overcome is the “impostor syndrome,” which is when students can’t realize their accomplishments because they feel they don’t belong, making them feel like a fraud. The percentage of Latin@ undergraduate engineering students has increased to 20 percent, a trend Larrabee said will continue. The main concern as the percentage increases, however, is the retention of those students. Larrabee uses technology in her classes to help students who may not feel as comfortable speaking in class or going to office hours. She utilizes at least a dozen online forums and a program that lets students submit questions anonymously during lectures. Computer science professor Linda Werner said understanding the success of underrepresented students can also start at the community college level, where over 13 million students are enrolled nationwide. According to a 2014 Excelencia in Education report, almost half of Hispanic institutions were public community colleges, compared to 20 percent public colleges or universities. Werner paired with a colleague for a two-year longitudinal study about the community college experience for African American and Latina women in computer science. While limited, the study explored the reasons why students chose computer science and their reasons for “persisting” or staying in the major. The two most common factors found for enrolling were interest in the subject matter and the desire to solve real world problems. On the other side, lack of mathematical preparation and lack of confidence posed the largest problems.